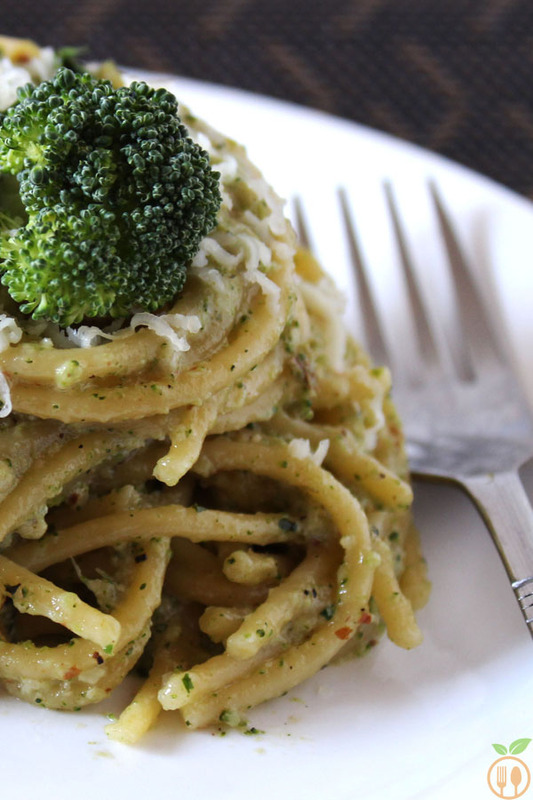 Broccoli pesto spaghetti topped with freshly grated cheese is quick and healthy dinner. 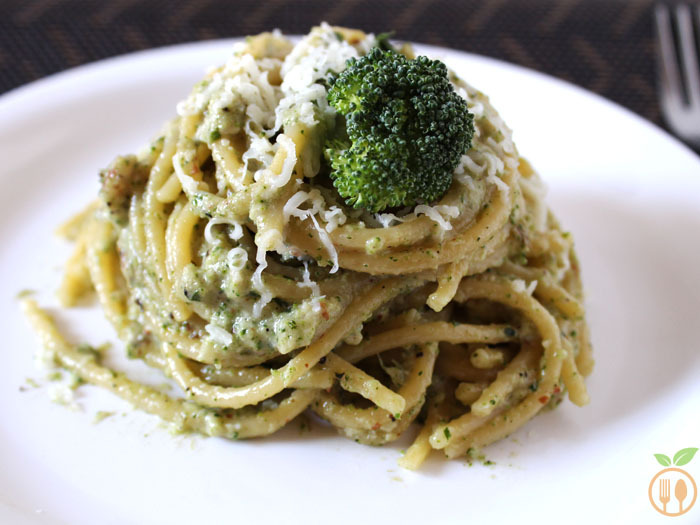 Do you know how to make delicious broccoli pesto spaghetti in just 30 minutes? Let’s make this together. This is one of the easiest pasta recipes. I have prepared it with very basic recipe of Broccoli Pesto which you can find in my previous week recipes. I told you about how I successfully created best broccoli pesto recipe after lots of experiment and also got some failures. Though I made mistakes, I enjoyed those mistakes and learned so many new things and also this got this all-in-one purpose pesto recipe. I also mentioned list of recipes that can be made from pesto recipes in my last week post, and spaghetti was one of them. I got the inspiration of this recipe from best cook in Italian cuisine Jamie Oliver. My background is Indian cuisine but I am very desperate about cooking Mexican and Italian cuisine. I learned so many recipes of those cuisines from various mediums like TV and various youtube channels. And yeah Jamie’s show was one of my favorite. His style to making and ordinary dish to extra-ordinary level impressed me, and I follow his easy recipes especially pasta dishes. I always try to make all other cuisines with Indian touch. But this authentic Broccoli pesto spaghetti impressed me so much that I cannot convinced myself to twist it by any Indian masala or any other spices ingredients. For cooking perfect non-sticky spaghetti, you need to boil water into large sauce pan, add salt and 1 tbsp oil into it. Now let water to boil for 10 minutes and then add spaghetti into it. Let it cook spaghetti until it become soft. Now immediately drain the hot water. And put spaghetti into chilled or iced water. Let it cook for just 30 seconds and drain the cool water. Now spread out the spaghetti on kitchen towel or on plate. This is best way to cook any pasta perfectly. 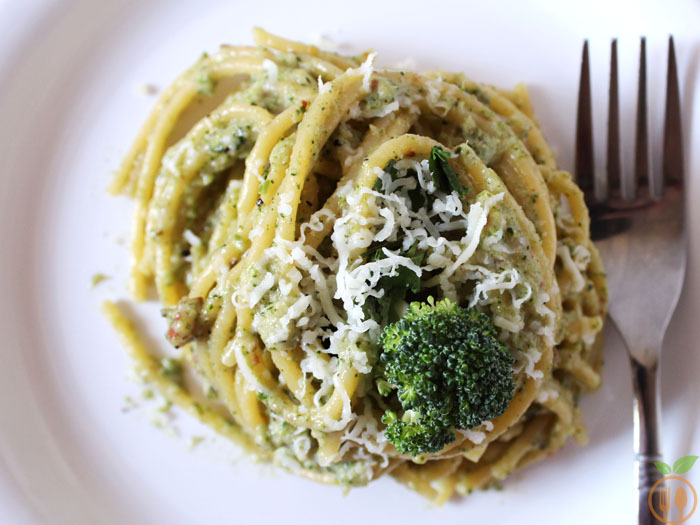 Broccoli pesto spaghetti topped with freshly grated cheese is quick and healthy dinner. I have prepared it with very basic recipe of Broccoli pesto which you can find in my previous week recipes. Cook the spaghetti according to package instruction. Heat the oil in a sauce pan on medium flame. Add garlic paste and sauté for 1 minute. Add broccoli pesto and just ⅓ cup of water. Cook it for 2-3 minutes or until the water will absorb by pesto and it cooks perfectly. Now add the cheese and cook until it melts into pesto. Adjust the taste by adding salt and pepper. Then add spaghetti and mix well into pesto sauce. Serve with some grated cheese. You can serve this spaghetti with some drinks. this is cool yet healthy recipe ! !